A previous peek at Apple’s iOS 4.2 beta hinted at a mysterious iProd2,1 product, which now appears to be the newest Apple TV according to The Unofficial Apple Weblog. For diligent hackers, jailbreaking the Apple TV just got a little easier, since iOS 4.2 was hacked only a few days ago. When the references to iProd2 were found earlier this year, many assumed it referred to a new iPad, since the iPad had been listed as iProd1,0 and iProd1,1 in early versions of iOS 3.0. 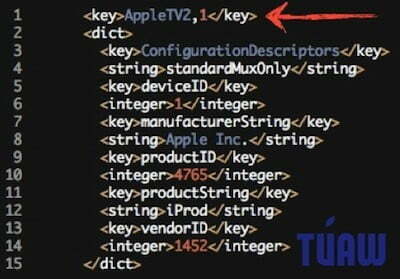 In iOS 4.2, the previous reference to iProd2,1 now reads AppleTV2,1. When Apple launched the Apple TV at its event earlier this month, the company downplayed the device’s operating system. However, it is now clear that the new Apple TV interface is based on the same mobile operating system on the iPhone and iPad as well as having the same A4 processor. There had been a substantial community devoted to modding the original Apple TV. With the newer device running an OS that hackers have already found a vulnerable exploit to, the new Apple TV is ripe for jailbreaking. Users will be able to install software not allowed by Apple on their modded Apple TV, if they wish. Apple might not be that worried, since the device will have minimal onboard storage and little memory. As Apple TV’s primary support is media streaming, a gargantuan storage is unnecessary. Even jailbroken, there may not be enough room or memory to run custom apps. There is also no indication of how apps will interact with Apple Remote. The new Apple TV is set to ship in 2-4 weeks time, priced at $99.